What started out as a shopping spree for one Seattle woman has grown quickly into a thriving enterprise providing living wages and essential benefits to the caretakers of a centuries-old cottage industry. Software engineer Afshan Abbas was strolling through her hometown of Karachi on the west coast of Pakistan in the spring of 2013 when she stopped to admire the handmade leather sandals, known as kolhapuri, being sold by merchants in the public market. She bought a few pairs on a whim. When she returned to work at Microsoft after her trip, she was stunned by the overwhelmingly positive reaction she received from friends and co-workers. "They looked perfect with everything I wore, whether it was a casual outfit with jeans, dressed up with a skirt or to accessorize a pair of slacks," she said. "The amazing thing is that I was bombarded with compliments every time I wore them. That's when I knew I had to share my discovery with women across America." Inspiration struck Abbas and Fuchsia Shoes was born. Abbas understood how to write code and was more than confident enough that she could accessorize any outfit. But she needed help with the logistics of manufacturing and imports. Abbas reached out to friends with her pitch for the new business. She ultimately partnered with Rameez Sajwani, an Amazon employee, to launch Fuchsia Shoes in the summer of 2014. 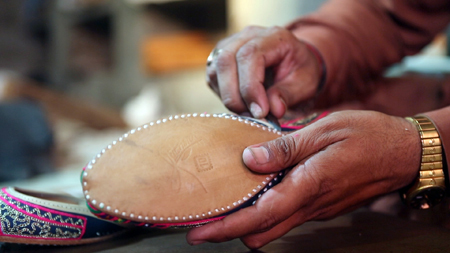 True to their discipline as engineers, the Fuchsia partners began with a beta test that consisted of a small collection of handmade khussas — a style of leather slipper different from kholapuri — from artisans in the small village of Sangla. The first shipment received rave reviews from friends and co-workers who purchased the entire lot. The second shipment was larger. The partners posted the shoes on a website that featured trendy footwear. The entire shipment of 300 pairs sold out in less than a day. "The name of our company did not come just from being a vibrant color, but because every pair is unique with its own personality and specific design," she said. "Fuchsia shoes are all handmade, so no two shoes are identical. There is no left shoe or right shoe when they are new. The soft leather actually forms around each foot to create the 'right shoe' for each person." The Fuchsia partners ramped up production of their footwear by streamlining sources for the necessary leather and silk. In addition to the handmade sandals and slippers, customers who buy Fuchsia shoes receive information about the individual artisan who made them and the distinctive process of crafting the stylish shoes. "I wanted to do something that has an impact on human lives, especially women," said Abbas. "Fuchsia was the perfect opportunity to live my dream." Fuchsia Shoes represents a cottage industry of artisans who spend up to three weeks making each pair of shoes using traditional methods of vegetable tanning and curing of the leather before the separate pieces are sewn together and adorned with embroidery. Sajwani secured reliable sources for the finest leather in the region, cured with salts that can only be found in Pakistan. Design for the embroidery is handcrafted separately on specialized materials that are then sewn into the leather shoes. Production was erratic at first, Sajwani said, because the craftspeople were often forced to stay home to take care of a sick child or elderly relative. Abbas had envisioned her business as a way to provide steady full-time employment to the artisans, while providing health care and other essential benefits to improve their lives. She reasoned that extending health care to members of the artisans' families would enhance production. Abbas had a popular startup, but every penny of profits from the steady growth of her business was being reinvested in the operation. She said she realized that, if she wanted to provide benefits and a living wage to her workforce in Pakistan, she would need an infusion of cash. The partners agreed to launch a Kickstarter campaign in February to reach their goal. Abbas' mother became concerned when her daughter resigned her secure position as a software engineer to dedicate 100 percent of her time to Fuchsia Shoes. Those worries calmed when the Kickstarter campaign reached its initial goal of $10,000 with 36 hours. The campaign would go on to collect $62,000 by the end of 30 days. Pledges came from individuals across the United States, plus Australia, Iceland, Germany, Switzerland, Japan and the UK. Other donors were attracted by a press release picked up by a website in Pakistan that promotes local businesses with ties to the U.S.
"It's safe to say that good news travels fast," Abbas said, flashing a wide smile. In the past 12 months, the company has sold and shipped more than 2,000 pairs of shoes in the past 12 months and has expanded its online catalog to include upgraded footwear with additional padding to appeal to women in urban markets. They have also developed new designs that incorporate traditional craftsmanship with contemporary styles. The origins of khussa can be tracked back to ancient China when the first of the ornate ballet slipper lookalikes were made of wood. It was during the reign of Mughal King Jahangir that shoemakers first used leather. Gems and colorful stitching were added by cobblers for royalty, but the basic design has become a mainstay for women in every economic class. The actual process of making khussa style shoes today still begins with vegetable tanning and curing of the leather before the pieces are cut separately and sewn to make the insole, outsole, sole and vamp. The upper parts and the sole are joined together with paste and then stitched by hand using white cotton thread. The shoes produced for American markets still resemble the traditional footwear that have been produced by native craftspeople for centuries. The traditional styles, said Abbas, are funky and fun. Abbas smiled again when she visualized the future for Fuchsia Shoes. "Beautiful shoes that empower women. What could be better than that?" More information about artisans who make the shoes and the long range mission of the Fuchsia partners is available at FuchsiaShoes.com.